drozer (formerly Mercury) is the leading security testing framework for Android. drozer allows you to search for security vulnerabilities in apps and devices by assuming the role of an app and interacting with the Dalvik VM, other apps’ IPC endpoints and the underlying OS. drozer helps to reduce the time taken for Android security assessments by automating the tedious and time-consuming. 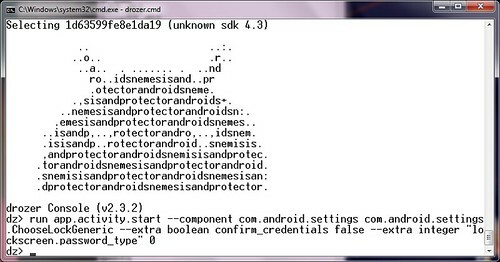 In a way you could think of drozer as Metasploit for Android devices. Discover and interact with the attack surface exposed by Android apps. Execute dynamic Java-code on a device, to avoid the need to compile and install small test scripts.